The holiday resort of Port d'Alcudia is situated in the north of Mallorca at the top of a long curving bay with a seemingly endless white sandy beach. It is two miles (3km) south of the historical old town of Alcudia, from which it takes its name. The sprawling, purpose-built resort, together with its neighbour Playa de Muro, stretches for five miles (8km) either side of the coast road and is particularly popular with British, German and Scandinavian holidaymakers. It has a fairly relaxed atmosphere; its spectacular beach is the major attraction, though it is also well placed for exploring the attractions around the north of the island. Alcudia doesn't have a distinct shopping district: shops selling buckets and spades and tourist trinkets line the beach road and the other small shopping areas dotted around the resort also cater mainly to holidaymakers. The satellite resort of Playa de Muro has an upmarket mall with some nice boutiques and the port area has a selection of designer shops. The supermarkets are good, stocking all the well-known brands along with cheap alcohol and cigarettes. The local market opens on Tuesday and Sunday mornings and the market in Inca, 15 miles (24km) inland, opens on Thursdays. Good buys include the porcelain and leather goods, but it is a good idea to bargain hard. Most restaurants in Alcudia cater to holidaymakers and unadventurous palates, with plenty of fast-food joints and cafés offering something with chips. There are also a few Italian, Indian and Chinese restaurants. The better restaurants are mostly in the port area, where diners can find some decent Spanish, French and seafood restaurants within a lovely harbour setting. Alcudia's recommended restaurants include Garlanda, Rancho Chico, Bistro Mar and Nova Marina, as well as Cas Capella and Casa Galega. Alcudia has lots of bars, pubs and discos catering for most tastes but this is not the resort for holidaymakers after some serious clubbing; for a bit of dancing, try the Mentra Disco. Many of the hotels offer in-house entertainment ranging from flamenco dancing demonstrations to stand-up comedy. 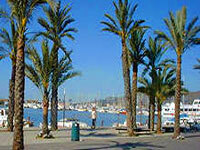 The activities in Alcudia are mainly focused along the spectacular five-mile (8km) beach that fronts the holiday resort. All sorts of watersports can be arranged, from scuba diving to banana rides. There are tennis and squash courts in the resort and nearby attractions include a water park, a go-kart track and horse riding stables. Boat trips can be arranged to the stunning Formentor promontory where passengers can snorkel or simply take in the views. The nearby towns of Pollenca and Alcudia (old town) and the mountain village of Lluc are worth exploring in search of a little culture, while those looking to get away from it all can take a trip to the mountainous western side of the island. The resort of Alcudia is not known for its architectural merit; its skyline is dominated by 1960s style apartment blocks. To the relief of many, Alcudia is not the resort for party animals; those looking for some serious clubbing should head for the south of the island.